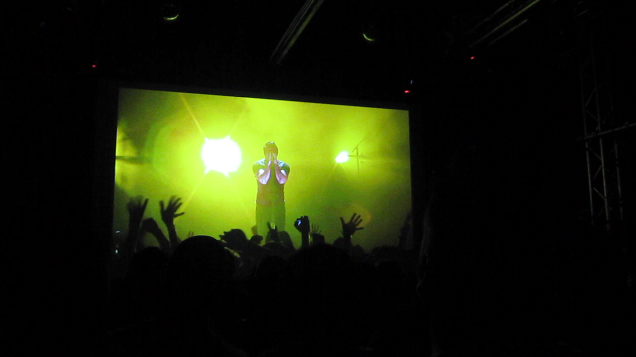 On Sunday night fans inside The Echoplex went off. The energy in the room was higher than what you’d see at many live concerts. But there was no concert at The Echoplex Sunday night. 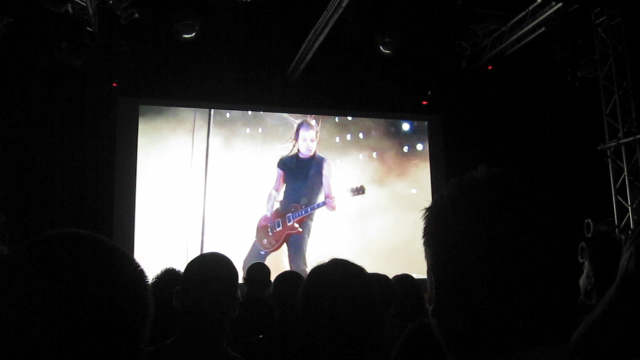 Instead, there was a screening of a live, fan-created, Nine Inch Nails DVD project: Another Version of The Truth. This is among the most energetic live concert DVDs ever produced, which is not hurt by the fact that it features one of the (if not the) best live bands in the world, Nine Inch Nails. On 5th May, 2008, Nine Inch Nails released “The Slip” for free via their website, as a gift to their fans. Or as Trent Reznor put it: “This one’s on me”. By working together, the Nine Inch Nails fan community have created “Another Version of the Truth” – a 3 disc release bringing together numerous editors, designers, and web programmers to create a professional digital film, followed by a physical release created by fans for fans. Every artist should strive for a fanbase as loyal and supportive as Nine Inch Nails fans. Every music fan should be so moved by their favorite band that they will invest not only their money, but more important, their energy, their creativity, and their undying passion, in a long-term relationship with the band. Every record label should pay attention. . . because this is what it’s about. However, until labels figure out how to authentically build an enduring relationship between Artist and Fan (as opposed to getting in the way of it), thankfully there are bands like Nine Inch Nails and fan groups like This One Is On Us who know what they’re doing. This One Is On Us did an amazing job with Another Version of The Truth. It may be fan-created, but it is professional quality and absolutely brilliant. They took hundreds of gigabytes of footage and created a piece that actually makes you feel like you’re at the show. I am a live music junkie and I’ll be among the first to tell you that there’s no substitute for being there. That said, I felt the drive, enthusiasm, and impact of the Nine Inch Nails Lights In The Sky tour – it felt like we were there. The audience sang along, screamed along, cheered and clapped. When I felt it was nearing the end, I actually got sad – I didn’t want it to end. When it was over, I had that post Nine Inch Nails concert rush and “All That Could Have Been” was my soundtrack for the drive home. If they truly don’t play live again and you never saw Nine Inch Nails, Another Version of The Truth will make you hate yourself for missing it. For those of you who have seen NIN live, Another Version of The Truth will help you relive it. I recommend watching it at least once a day. The This One Is On Us organizers did an amazing job hosting this event. 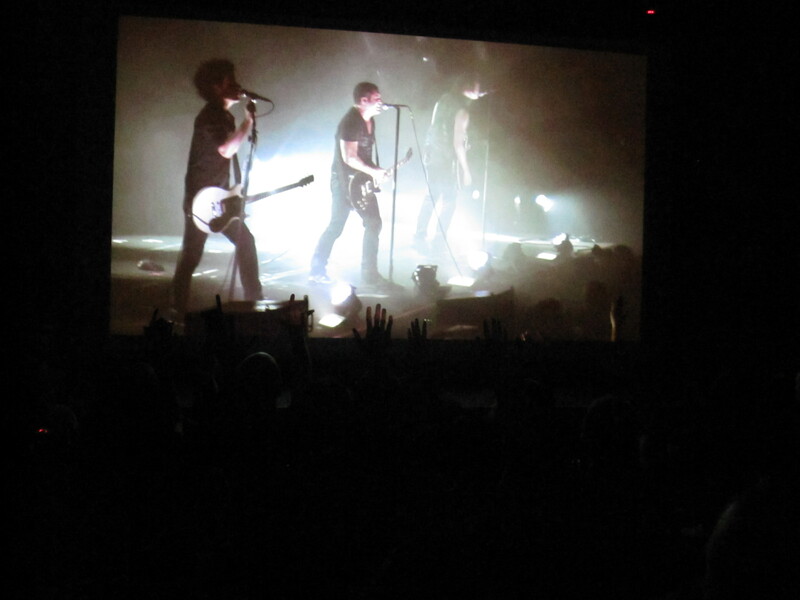 The sound was great, the screen was placed at a perfect height so that the audience at the screening was watching from the same perspective as the audience at the concert. When there were crowd shots, you were among them. 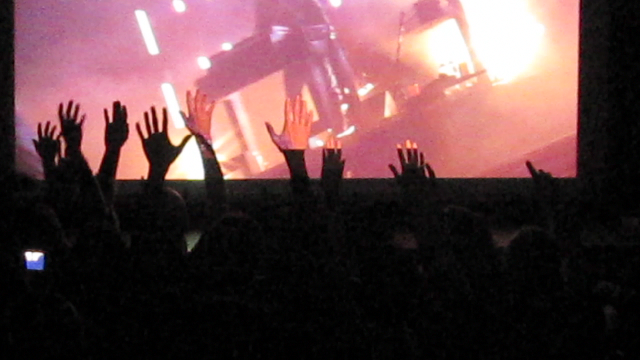 When the audience at the screening put their hands in the air, they were among the hands on the screen. In fact, when I posted videos from the event on YouTube (see below), people emailed me asking if it was 3D. The organizers secured The Echoplex for the screening which added to the energy of the event. 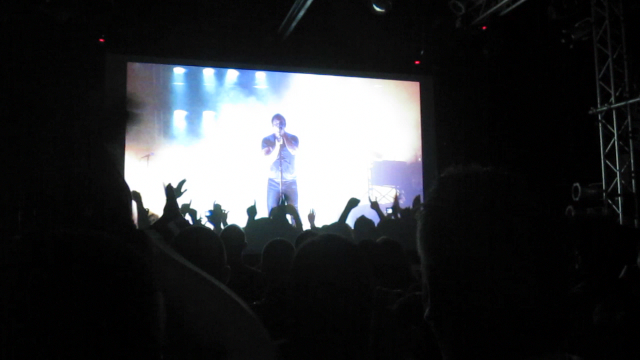 Nine Inch Nails played one of their final Wave Goodbye shows at The Echoplex last year. You could still feel the energy of the band in the venue which added to Sunday’s event. As it turns out, several members of the band from the Lights In The Sky tour were in the venue and participated in a surprise Q&A following the screening. 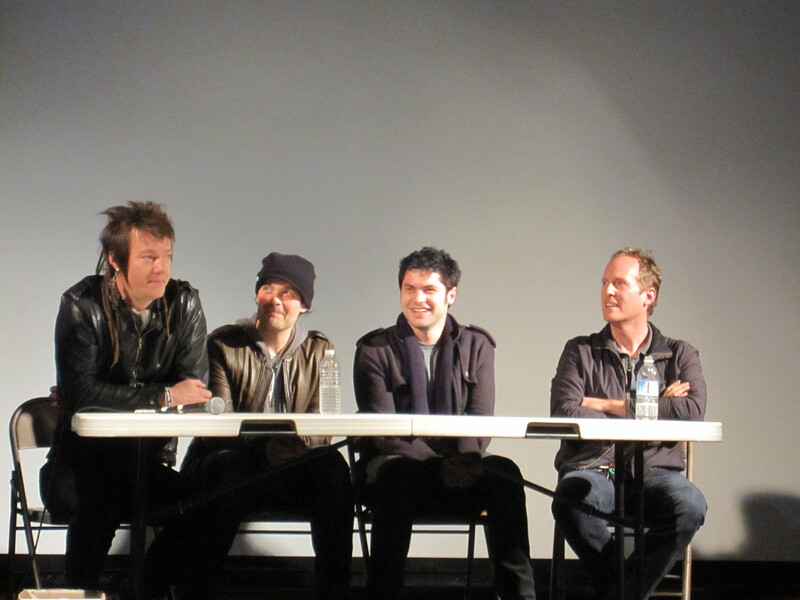 Josh Freese, Robin Finck, and Alessandro Cortini sat on a panel and graciously answered audience questions about the tour, rehearsals, and the possibility of a reunion. Rob Sheridan, Nine Inch Nails’ creative director, was also in the house to answer questions. Sheridan shared a great deal of amazing information about the technology used on the tour, decisions that needed to be made based on budgets, what happened when things didn’t work, along with funny anecdotes about how Reznor and Freese worked with the technology. Below are some videos of the screening itself. Yes, that’s the audience at the screening singing, cheering and clapping along with the band and audience on screen. Screenings of Another Version of The Truth are taking place around the world – check listings here. And, since chances are Sheridan and the band may not show up at other screenings, I’ve also posted some clips from the Q&A. There is another fan-created project to be on the lookout for as well: Nine Inch Nails: After All Is Said and Done, produced by A Tiny Little Dot. After All Is Said and Done will document Nine Inch Nails last show ever that took place at The Wiltern on September 10, 2009. I was at that show (review, pics, set list and videos are posted here) and met the organizer of A Tiny Little Dot, “Synthetikz”. He’s a really good guy who obtained some amazing footage. I posted the trailer below so you can see for yourself. This entry was posted in The Echoplex and tagged Alessandro Cortini, Another Version of The Truth, AVOTT, Echoplex, Josh Freese, NIN, Nine Inch Nails, Rob Sheridan, Robin Finck, This One is On Us, TOIOU, Trent Reznor. Thanks for the cool write up. It’s really awesome hearing that the screening went so well and seeing those videos or the crowd really getting into it. I’m on the TOIOU team and I actually edited half of the concert they showed, so it really is great seeing that so many people enjoyed the screening and the Q&A afterwards. Unfortunately I couldn’t be there myself as getting to LA is a little cost prohibitive when you live in Australia.